The Game is afoot as I proceed to platform 4 prepared to catch the train to New Haven and the 138th meeting between Harvard and Yale. The sky is blue and the air is crisp. Perfect for some late fall football in New England. Standing at the station amongst a swarm of young people who don’t really look like they know or care a lot about football. Looks can be deceiving. Leggings and flannel are not necessarily an indication of gridiron expertise. Maybe they’ve come for the party. Standing room only on the Metro North. Extra seats occupied by red solo cups and V8. Must be Bloody Mary season. A little hair of the dog for occupants of the 3rd car from the front. Harvard fan sitting cross legged on the ground with his head in his lap. Not a good sign for 9:30 in the morning. Eavesdropping is entertaining but ultimately disheartening. Would love to share my views on the bullish bond market but my lack of financial expertise makes me feel like an impostor. My education has not prepared me for this moment. As our train full of privilege passes over abandoned vehicles and dilapidated apartment complexes we are all reminded of the great divide between the haves and have nots. The train itself seems to recognize this chasm, picking up speed around some of the worst neighborhoods so it’s passengers won’t be bothered by the world outside this protective bubble of entitlement and opportunity. When we arrive at Union Station people hatch from the train like salmon spawning in the rivers of the Pacific Northwest. The walk to the Yale Bowl is upstream after all and with cab lines extending around the block it’s a good thing I wore my walking shoes. Now only 1.5 miles to the stadium. Passing through the heart of campus. History is overwhelming. Buildings cast an intimidating shadow as the eyes of past Presidents and poet laureates stare down disapprovingly like they know I don’t belong. Duck out of the commons and back onto the main thoroughfare where the stench of vodka cranberries wafts down from the pack of young alums in front of me. At this rate they’ll never make it through to the end of the game let alone halftime. These amateur alcoholics needs to take a lesson from the tortoise. This particular section of New Haven has a rich history beyond Yale’s generous gentrification. On this day packs of football fans are stomping down sidewalks once trampled by Revolutionary Era horse and buggy. Finding my friends amongst a sea of Blue and Crimson is a difficult task. They’re here to work, which during an event like The Game means networking, shaking hands and reminding loyal grads why they still love their school. And if that’s not enough, here, enjoy a complimentary beer koozie. The tailgate itself is a nostalgic gathering of old and new friends. Clubs are represented by white tents and underneath each of these canopies lies an assortment of treats and refreshments befitting any generation or graduating class. When people are introduced they almost always indicate their graduating class, which to the majority of Harvard and Yale alums serves as a simple form of identification, much easier to remember than a social security number. Yet another reminder that Father Time remains undefeated. Walking into the Yale Bowl is an unforgettable experience. The symmetry of the stadium evokes the classical architecture of ancient Rome. This coliseum in Connecticut has been staging battles for a century while we the emperors clap our hands together as a showing of gratitude for the gladiators down below. Our section is occupied by some of Harvard’s most prestigious and loyal alums. Take Bill Markus class of ’60. He’s the sort of loyal follower who knows all the players without looking at the roster, calling them by there proper birth names like running back Paul Stanton Jr. Mr. Markus also has the endearing habit of creating acronyms for innocuous occurrences like IWV, or Increased Wind Velocity. Sport’s traditions survive because of people like Mr. Markus. 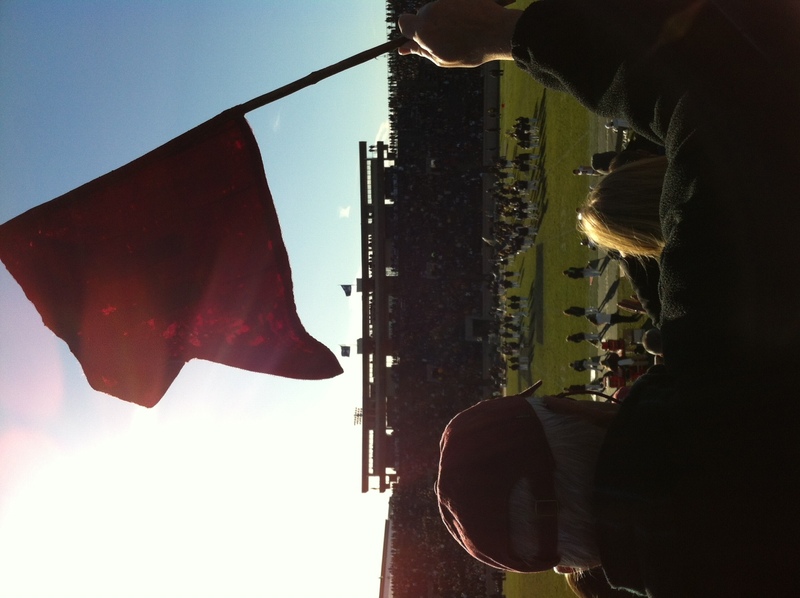 Take the famous Harvard Little Red Flag that has been in attendance for every Harvard/Yale football game since 1884. 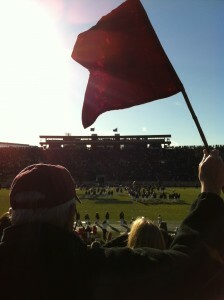 Bill has been bestowed with the honor of waiving the flag at these games since 2001. People approach him with great reverence. Pictures are taken. Memories are created. The Game itself was spectacularly unspectacular with favorite Harvard defeating Yale 34-7. Thanks to Dartmouth beating Princeton the Crimson clinched a share of the Ivy League title while the Bulldogs continue to toil away in the middle of the pack. The game within the Game included a few separated shoulders and knees, nothing we haven’t come to expect on 100 yards of sod. A Harvard safety was thrown out of the game during the second quarter for launching himself at a defenseless Yale receiver. Not like the Yalies put up much of a fight during the remainder of the game but rules are rules. The game ends without controversy. The Crimson march away with 7 in a row as the band serenades the team into the Thanksgiving break. The Yale contingent can take solace in the fact that their classes will not resume until December while the Harvard student body returns to Cambridge for two days of lecture halls and homework before turkey. But none of that matters so long as they can keep warm. On the frigid return trip to the station Bud Light Platinums have been traded for iPhone chargers as the energy starved status undaters send one final Facebook message before the light goes dark. The wind has picked up foreshadowing a cold holiday week again. With hangovers and hangers on in tote, these fastidious fans of the Ivy League bid farewell to New Haven and football for another year waiting for Harvard and Yale to meet again along the banks of Charles River for the 139th playing of The Game. Bill Markus will be there. And so will the Little Red Flag, mothballs and all.